Being oneself isn’t always easy, especially when we’re pressured to conform by others from both our culture and our own immediate family. The implications of this can be wide-ranging, too, including everything from our vocations to our romantic life. Those are among the challenges a would-be stand-up comedian from Pakistan must confront after he and his relatives immigrate to the US in the charming yet edgy new fact-based romantic comedy, “The Big Sick” (web site, trailer). Aspiring comic Kumail Nanjiani (portraying a fictional version of himself) longs to make it big doing stand-up. It’s a fulfilling but difficult path to follow, so, to keep a roof over his head in the meantime, he drives for a ride sharing service. 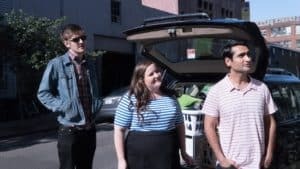 But, when he’s not busy chauffeuring passengers, he spends his nights honing his craft at Chicago comedy clubs with fellow comics Mary (Aidy Bryant), CJ (Bo Burnham) and Chris (Kurt Braunohler), hoping to earn a slot at the prestigious Montreal comedy festival. To keep matters as simple as possible, Kumail’s evasive when his family presses him for his views about the many spousal prospects they introduce him to. 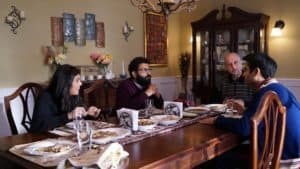 What’s more, he tells them nothing about Emily, confiding only in his brother (Adeel Akhtar), who urges him to break off the relationship and get with the program. But Kumail feels compelled to follow his own course, despite the potential pitfalls. As the couple grows more serious about one another, talk of a more lasting commitment begins to stir, especially when Emily tells Kumail she wants to introduce him to her parents, Beth (Holly Hunter) and Terry (Ray Romano), when they visit from North Carolina. However, when Kumail makes no attempt to return the favor, Emily grows suspicious, and, when she learns that he hasn’t told them about her, she’s furious. The budding romance quickly comes crashing down in what appears to be a fiery conclusion. 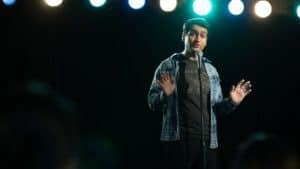 Not long thereafter, however, Kumail receives a frantic late night phone call from one of Emily’s friends (Rebecca Naomi Jones), informing him that she’s been hospitalized with a serious but unexplained illness. Given that Emily’s parents have not yet arrived, she asks Kumail to be with her in the emergency room. Considering their breakup, he hesitates initially but soon relents, a gesture that Emily rebuffs without hesitation as soon as she sees him. Matters take a quick turn for the worse, however, when Emily’s doctors inform Kumail that her illness is much worse than thought and that she must be placed in a medically induced coma to stabilize her condition. Despite their recent past, though, he decides to hang in with her, a situation that becomes even more trying when Beth and Terry arrive to meet the man who broke their daughter’s heart. These precarious circumstances thus set the tone for what follows. A number of story strands are left to play out, such as the state of Emily’s health, the future of Kumail’s professional stand-up career, his enduring challenges with his meddling family and his relationship to a woman and her family with whom he no longer has any seemingly substantive connection. It’s a lot to work out, but it’s also a profoundly meaningful exercise in what it takes to truly become and be oneself. “The Big Sick” brilliantly breathes new life into a genre that has grown progressively tiresome and stale. 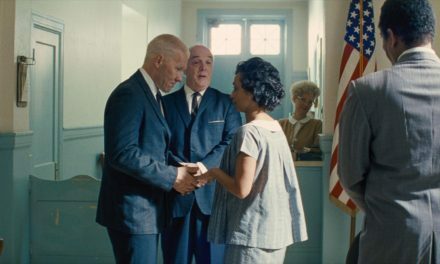 Based on the protagonist’s own unusual courtship experience, the film takes chances (and succeeds beautifully) that movies of this ilk are seldom willing to do. Despite a slight tendency to drag a bit in the final 30 minutes, this fresh, lively offering features fine performances all around (especially by Hunter and Romano in strong supporting roles) and raucously funny bits not typical of rom-coms. Anyone who’s ever had experiences with an unconventional relationship or the challenges of staking one’s own ground will certainly appreciate the wit and wisdom of this offering, as will those looking for something more out of the tried-and-true romantic comedy format. Making one’s voice heard amidst a thunderous throng of opposing viewpoints can be difficult, especially when expressed by someone “saddled” with qualities that might tempt others to downplay the significance of those opinions. Yet making the effort to get those views heard is important, especially when the stakes are high. 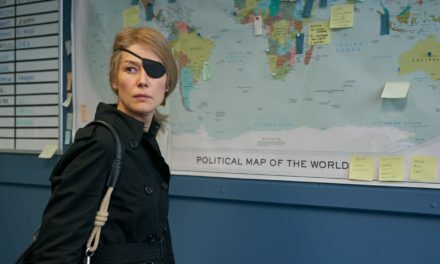 So it was for an insightful woman seeking to be heard in the geopolitical arena, an area where others often tried to drown her out, as outlined in the engaging new documentary “Letters from Baghdad” (web site, trailer). 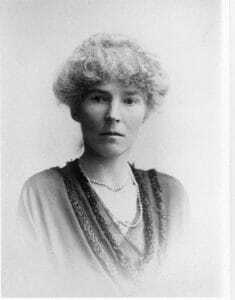 British-born diplomat Gertrude Bell (1868-1926) is far from a household name, yet her influence was significant, if not always taken seriously. As a longtime explorer of the Middle East, she became an astute scholar of the complex culture of the region, penning a number of books and papers about it. 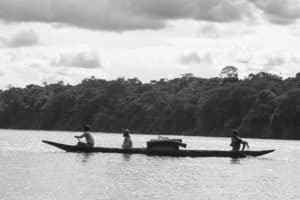 She thoroughly understood the nuances that characterized the tribal societies of the region, as well as the significant impact that occupying forces had on those cultures. She had much to offer to those who would listen to her; the trick was getting them to listen. 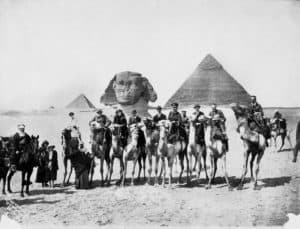 The life story of British-born diplomat Gertrude Bell (1868-1926) provides the basis of the inventive new documentary, “Letters from Baghdad.” Photo courtesy of Getty Images. In a male-dominated endeavor like international politics, it wasn’t easy for a woman to be taken seriously. But those who took the time to listen to her could see and appreciate the depth of her knowledge, and they heartily embraced and endorsed her views. This earned her a number of prestigious diplomatic assignments with the British government, including being named the only female delegate to the Paris Peace Conference that formally ended World War I. Those who valued her opinions, like T.E. Lawrence (“Lawrence of Arabia”), Winston Churchill and Sir Percy Cox, valued her input with various matters, most notably drawing the borders and setting up the government of post-war Mesopotamia (now Iraq). She would also go on to become the driving force behind the establishment of the world-famous National Museum of Iraq. Yet, for all of her accomplishments, Bell also had her share of disappointments. For instance, in helping to set up the Iraqi government, she was disappointed by some of the ways it was mishandled. In particular, she was discouraged that what should have been an Iraqi government with British advisors had turned into a British government with Iraqi advisors. She could see the dangers in the imposition of Western ways on a traditions-based culture not accustomed to such practices, a prescience that would prove to be uncannily accurate years later. 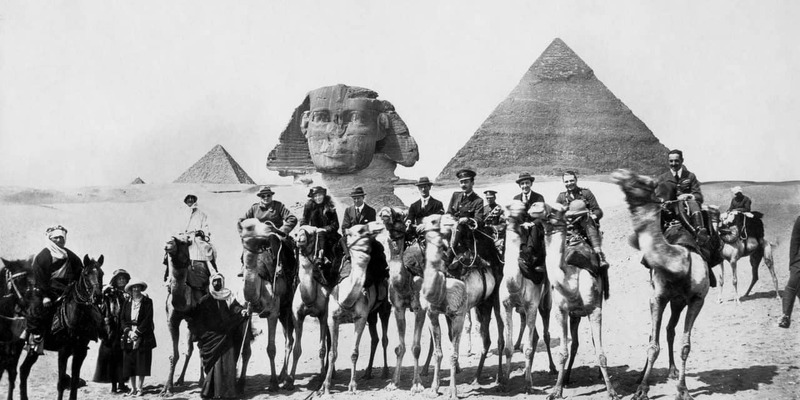 British-born diplomat Gertrude Bell (second from left, directly under Sphinx head) is joined by peers on a trip to Egypt, including Winston Churchill (left of Bell) and T.E. Lawrence (right of Bell), one of many archival images featured in the new documentary, “Letters from Baghdad.” Photo courtesy of Getty Images. It’s astounding how someone who had achieved so much – having even become known as the female Lawrence of Arabia – has come to be a virtual unknown today. Thankfully, this film brings her back to life, drawing exclusively upon her own words and those of her contemporaries, including personal letters, diaries, writings and official documents. Bell’s words are enlivened through the voiceover narration of Tilda Swinton, and those of her colleagues are expressed through re-created actor impersonations. Intercut with this material is a wealth of archival footage, many of it never seen before, depicting the Middle East of the late 19th and early 20th Centuries. Directors Zeva Oelbaum and Sabine Krayenbühl have amassed a remarkable documentary that provides a comprehensive view of its subject both personally and professionally, a rare fusion indeed. Its inventive cinematography, blending black-and-white and colorized footage, makes for intriguing viewing, bringing the images to life in a variety of ways. 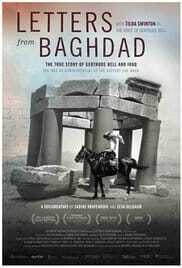 Admittedly, the narrative would have benefited from some additional historical context to better inform viewers who are less studied on the subject matter of the period, but, this shortcoming aside, the film presents a candid look into the life of someone who wielded considerable influence – and may have been able to accomplish even more were it not for the archaic prejudices of her day. 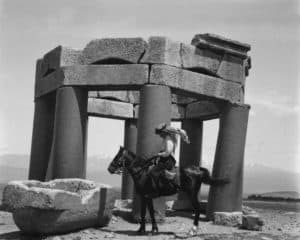 Years of studying and exploring the Middle East made British-born diplomat Gertrude Bell (1868-1926) an expert on the region’s culture and antiquities, as outlined in the new documentary, “Letters from Baghdad.” Photo courtesy of Getty Images. 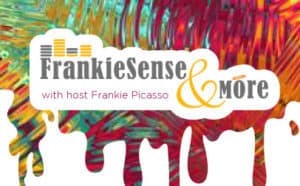 Join host Frankie Picasso and me this Thursday, July 6, at 1 pm ET for the next Movies with Meaning segment on Frankiesense & More radio. We’ll talk about several current film releases and other movie news. Tune in live or listen to the on-demand podcast for some lively movie talk! What happens when individuals from two very different worlds come into contact with one another? In some instances, such clashes of cultures can have devastating effects. But, in other cases, the interaction can lead to entirely new understandings of one another, especially for those whose eyes have been closed to revelatory insights and blinded by superficial and materialistic concerns. 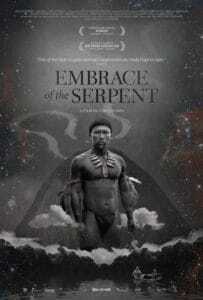 Such is the experience of two Western explorers who journey into the remote Amazonian rainforest in the stunningly beautiful Colombian epic, “Embrace of the Serpent” (“El abrazo de la serpiente”) (web site, trailer), available on DVD, Blu-ray disk and video on demand. Based on the diaries of explorers Theodor Koch-Grünberg and Richard Evan Schultes, the film follows the exploits of two similar but fictional adventurers (Jan Bijvoet, Brionne Davis) as they make their way into the jungle in search of the rare yakruna plant. The common element linking these two journeys, which take place 40 years apart, is their shamanic guide, Karamakate, who meets his Western companions first as an impassioned young man (Nilbio Torres) and later as aging guide with a failing memory (Antonio Bolívar Salvador), not only for his surroundings, but also for his mission in life. Through their sometimes-contentious interactions, however, they bring meaning to one another’s lives – and in ways none of them may have anticipated. Despite some occasional pacing issues and a periodically under-explained back story, this gorgeously filmed release explores a variety of issues, from reverence for the environment to respect for other belief systems to understanding the true nature of our place in the Universe. With elements reminiscent of “The Mission” (1986), “Apocalypse Now” (1979) and even “2001: A Space Odyssey” (1968), this unique production offers viewers an intriguing array of images and ideas, all framed within a backdrop of stunning black-and-white cinematography. It’s easy to see how this picture deservedly became one of 2015’s Oscar nominations for best foreign language film and an award winner at the Cannes Film Festival. It also won the Sundance Film Festival’s Alfred P. Sloan Feature Film Prize for movies that promote cross-cultural understanding. While this may not be everyone’s cup of tea, the film is definitely something worthwhile for those who appreciate decidedly different viewing options. Considering how easy it is to become preoccupied with the minutiae immediately before us, it’s often helpful to be reminded of the greater scheme of things and how we figure into it. 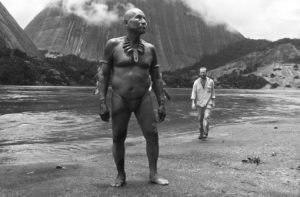 “Embrace of the Serpent” does just that, prompting us to take a wider view of what it all means.